At least nine Iraqis were killed in an overnight suicide bombing in a remote village north of Baghdad, officials said Friday, taking the number of people killed during a bloody day of violence in Iraq to almost 50. The suicide car bomber targeted a gathering of followers of the mystic Islamic Sufi movement, killing at least nine Iraqis and wounding 12 in Yethrib, a remote village near Balad, north of Baghdad, hospital Dr. Faiz Shawqi said. The suicide bomber also died. "I was among 50 people inside the tekiya (Sufi gathering place) practicing our rites when the building was hit by a big explosion," said Ahmed Hamid, one of the Sufis, who are regarded as heretics by Islamic extremists believed responsible for suicide bombings. "Then, there was chaos everywhere and human flesh scattered all over the place." Thursday's carnage claimed the lives of at least 48 people, including more than 30 in four suicide bombings across the country's north and a Shiite cleric in the southern city of Basra. At least 825 people, including U.S. forces, have been killed since the new Shiite-led government was announced April 28, underscoring the fragility of this country's reconstruction. Iraq's Interior Minister Bayan Jabr on Thursday claimed the government offensive seeking to root out kidnappers and other militants in Baghdad had scored big gains, saying this week's sweep by Iraqi soldiers and police captured 700 suspected insurgents and killed 28 militants. But the incessant violence launched by a host of militants, from Islamic extremists to Saddam Hussein loyalists, highlights how far security authorities need to go to stop the killings. Australia's top Muslim cleric, who is in Iraq trying to secure the release of 63-year-old Australian hostage Douglas Wood, said Friday that he hoped to receive news within "hours" of the captive's imminent release. He did not elaborate. Gunmen killed Brig. Sabah Qara Alton, a Turkman official at Kirkuk City Council, after he left a mosque in the ethnically mixed northern city following Friday prayers, police Capt. Sarhad Talabani said. Early Friday, gunmen killed Razzouq Mohammed Ibrahim, an Iraqi contractor in charge of renovating a mosque in western Samarra, and stole his car, police Lt. Qassim Mohammed said. Two Iraqi civilians, including a child, were killed when their car swerved into a U.S. Bradley fighting vehicle near Khalis, 50 miles north of Baghdad, early Friday, the U.S. military said. Earlier in Tuz Khormato, a popular highway stop 55 miles south of the oil-rich town of Kirkuk, a suicide car bomber targeted bodyguards for Iraq's Kurdish deputy prime minister as they ate at a restaurant. The blast killed 12 people. Another suicide car bomber trying to attack a convoy of civilian contract workers in Kirkuk killed a young boy and three other Iraqi bystanders and wounded 11. Four people were killed and four others wounded by a suicide car bombing in Baqouba, about 35 miles northeast of Baghdad, including a deputy provincial council leader. In the northern city of Mosul, two parked motorcycles rigged with bombs blew up near a coffee shop, killing five Iraqis and wounding 13. In the capital, men in three speeding cars sprayed gunfire into a crowded market in the northern neighborhood of Hurriyah, killing nine people, the interior and defense ministries said. 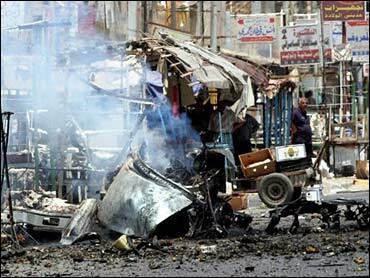 Two other Baghdad attacks killed four people and injured three. Gunmen shot dead Shiite cleric Ali Abdul Hussein outside his home in Basra, 340 miles southeast of Baghdad, said police Capt. Mushtaq Taleeb. At least 10 Shiite and Sunni clerics have been killed in the latest surge in violence. As part of the campaign against insurgents, Iraq's government launched in Baghdad on Sunday the biggest Iraqi offensive since Saddam Hussein's fall two years ago. Iraqi officials have said the operation involves 40,000 soldiers and police, though not all are manning positions at any one time. Before the offensive, authorities controlled only eight of Baghdad's 23 entrances, Jabr said. Citing figures obtained from an Interior Ministry research center, Jabr said some 12,000 Iraqi civilians were killed during the past 18 months, including more than 10,000 Shiites. But he said he analyzed the figures on the basis of areas where the victims lived, not data explicitly stating the branch of Islam they belong to. Jabr said the Baghdad operation had netted at least 700 people he labeled "terrorists" and killed 28 rebels in firefights. In addition, 118 criminal suspects had been arrested. A Marine Corps lieutenant cleared of murder charges for riddling two Iraqis with bullets and hanging a warning sign on their corpses says he now plans to ask for a discharge. Second Lt. Ilario Pantano said Thursday his fight against the charges was tiring and heartbreaking. Pantano, 33, did not deny shooting the men or hanging the sign that said, "No better friend, no worse enemy," a Marine slogan. But Pantano said he shot them in self-defense after the men disobeyed his instructions and made a menacing move toward him. Last week, Maj. Gen. Richard Huck, commander of the 2nd Marine Division based at Camp Lejeune, dropped the charges against Pantano. "This is the best thing for my family, and I think it is the best thing for the Marine Corps, too," he said.